A safe and adequate blood supply is essential to the healthcare industry. New advances, particularly in the area of automation, have enhanced both safety and blood availability. In recent years, many manufacturers have introduced several next-generation products to replace first-, second-, and even third-generation systems. These newer systems, which are completely automated, can process many more test samples per hour. For example, automation has accelerated the donation process. Traditionally, donors give a single unit of red blood cells using manual procedures. But new technology makes possible the collection of two units of red cells from a single donation through a process called double red cell apheresis. Blood typing and disease screening have also benefited from automation. Indeed, recent developments in safety testing and quality assurance of blood and plasma also have affected the market. These critical developments include incorporation of genetic engineering techniques to make recombinant clotting factors and human serum albumin, new methods of processing blood, and the discovery of other specialized blood cells such as stem cells and dendritic cells. According to BCC Research’s The Global Blood Industry (HLC008J), the global blood market, which includes products used for collecting, processing and transfusion of blood and the sale of blood therapeutics, was valued at $30.1 billion in 2014. By 2019, these products are forecast to reach $38.2 billion in sales, reflecting a five-year compound annual growth rate (CAGR) of 4.9%. The largest segment of the market, blood therapeutics, will reach sales of $31.1 billion and a CAGR of 5.1% in 2019. Blood typing and screening products, the second-largest and fastest growing segment, is forecast to reach $3.4 billion in sales and a 5.4% CAGR. The global rise of diseases such as cancer, diabetes, cardiovascular disease, infection, etc. are also contributing to the importance of blood test diagnostics. Early detection of these metabolic conditions and diseases can be life-saving. Consequently, blood tests have become indispensable tools. Technological advances and recent innovations have resulted in the development of blood tests that can be used in the home or near the patient’s bedside with the same accuracy and potential as that of standard testing procedures. Moreover, the introduction of point-of-care testing has revolutionized blood test diagnostics and has made it into a field with high potential for testing of various conditions such as blood disorders, diabetes, and cardiovascular risk, as well as treatment monitoring and infectious disease screening. The pipeline for new laboratory developed tests and in vitro diagnostics is robust with new tests in preclinical (developmental), research-phase status. Collaborations, mergers and acquisitions, licensing agreements, and joint developments are the driving influences of this market. Major players include Roche, Thermo Fisher Scientific, Siemens, Danaher, Alere, LifeScan Inc., Bio-Rad Laboratories, and bioMerieux. The pathway for the discovery of more innovative, reliable, rapid tests has been established for various conditions such as cancers and infectious diseases; for organ functionality testing; and for biomarker and screening tests. Advancements in technology have led to simple blood tests that can diagnose major depression in adults and blood testing that can predict with 90% certainty whether a senior will suffer from dementia (Alzheimer’s disease) within the next few years. The use of automatic analyzers with nucleic acid amplification technology and diagnostic platforms with incorporated innovative bio-photonic detection technologies that make use of reporter enzyme fluorescence result in faster diagnosis. The results are more accurate compared to those given by traditional testing. Indeed, the use of biomarker technology for detecting RNA, DNA, and enzymes is a technology that has been widely implemented in most clinical scenarios and laboratories. Scientists also are working their way toward designing a biomarker blood test for lung cancer that can analyze small molecule metabolites in the blood. They are also trying to develop a simple blood test that can screen for colorectal cancer. These tests are based on studying the molecular events involvement in the development of various cancers, abnormal deoxyribonucleic acid (DNA) methylation patterns, and presence of microRNA in the blood and the tissues involved. Additionally, European maternity clinics are tailoring a noninvasive maternal blood test for Down syndrome for medium-risk and high-risk women. The test is a simple blood test that detects the abnormalities of fetal DNA in the blood plasma of pregnant women. Further, scientists at Virginia Tech’s Virginia Bioinformatics Institute, in collaboration with the Center for Cancer and Blood Disorders at Children’s National Medical Center, are designing a new way to diagnose brain cancer based on the genetic markers found in junk DNA or microsatellites. According to BCC Research’s Blood Testing: Technology and Global Markets (HLC184A), the global blood testing market is expected to reach $56.6 billion by 2019 and register a CAGR of 2.6% from 2014 through 2019. 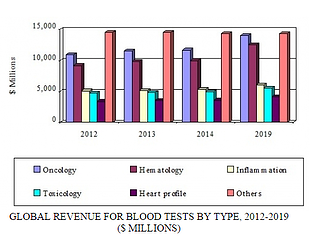 The market for blood tests in cancer or oncology is the largest segment in terms of revenues. However, blood tests used for identification of serious infections, diabetes, and cardiovascular disease is expected to increase. The oncology blood testing market for 2013 was about $11.6 billion, which is expected to rise with a CAGR of 3.7% from 2014 to 2019. 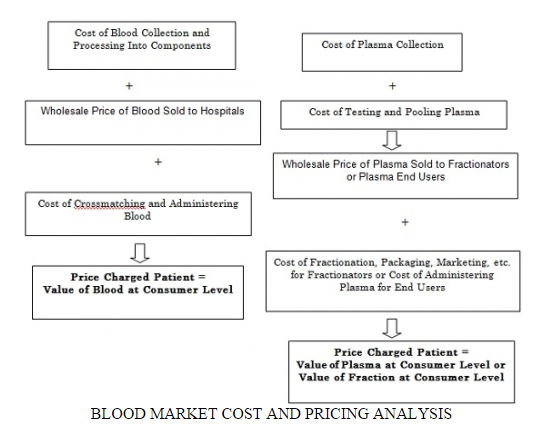 The hematology blood testing market in the same year was $9.8 billion. The revenues of the inflammation, toxicology, and heart profile markets were nearly $5.2 billion, $4.9 billion, and $3.5 billion, respectively, in 2013. The oncology, hematology, toxicology, inflammation, and heart profile blood testing markets have been positively impacted with the rise in diseases such as cancer, diabetes, heart disease, blood disease, and infectious diseases corresponding with an aging population. Therefore, the CAGRs of these markets are expected to increase between 2014 and 2019. However, other categories have been negatively impacted by saturation of the market with multiple testing strategies and by government austerity measures.